Monitoring food consumption has numerous benefits not only in the prevention of food wastages but also in studying variousfood and dietary habits of people. In a country like India having a population of 1.25 billion where majority of the diet consists of pulses and rice there is no perfect way to determine how much of the food is being consumed daily/weekly or annually, other than manually keeping the track of this information in household. In Every household there are at least 10-15 such containers (made of plastic or steel) containing various pulses and food items .Using STMicroelectronics components (MCU ,Sensors and NFC-Near Field Communication) such plain containers can be converted to smart containers which can help in tracking the amount of food consumed. 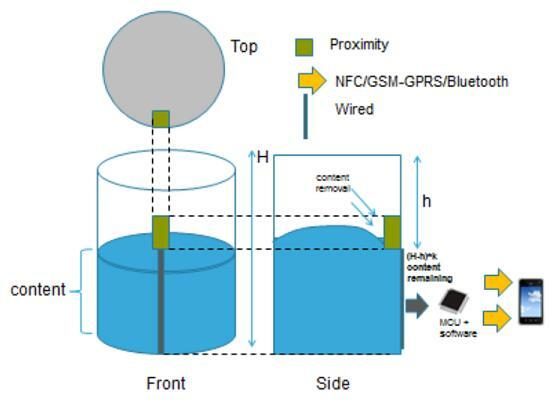 The purpose of this article is to explain the design and operation of such prototype developed by STMicroelectronics. A system consist of Microcontroller(MCU), Sensors and connectivity module (NFC/Bluetooth) can be used for food content level detection in a container and this information can be transferred to a remote PC or Handheld device manually(or automatically). Food content can be solid(pulses, rice, sugar, etc) or any liquid(juice, oil, milk, etc). LDR(Light Dependent Resistor), Proximity and/or Ambient Light Sensor can detect the level of food in a container via a trigger depending on the type of the sensor and intimate MCU (Microcontroller Unit) which then transmit this information to a remote PC/Mobile via NFC(Near Field Communication) or Bluetooth. Transmitted information could be the amount and the type of the food whose information is already stroed in the MCU flash .e.g container #1 containing pulses1,container #2 containing pulses #2 and so on. 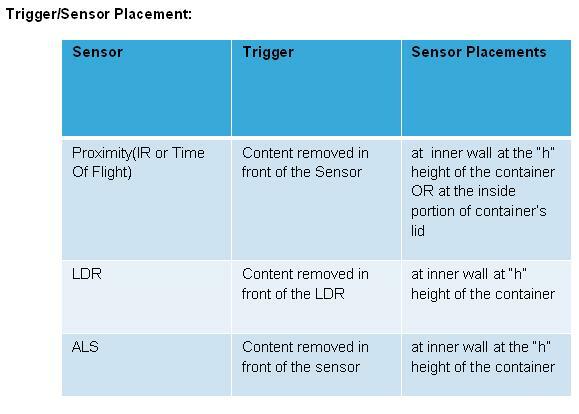 See the trigger table below for the respective sensors and their placement with respect to the container below .MCU can also store each box’s content’s information(density,height,type) and can calculate the amount of the content present based on the height “h” or “H-h” of the content. Fig 2 .Histroy of food consumed derived from the Smart Containers. 2. Food Items supply chain – Malls, Supermarkets, restaurants, grocery shops to track the amount of food sold. 3. In chemical industries to keep the tracking of the amount of chemicals (liquids especially) consumed. 4. Data can be used by the Government authorities to regulate and monitor the food stock.